This was approx a 1 min exposure with Kodak 200 gold film using a Pentax K1000 35mm SLR set at F2 with a standard 50mmm lens. Some LA Basin light is evident in the exposure, but the image does capture the long tail through the sky, including the first two stars in the big dipper (center tail and lower center of image). 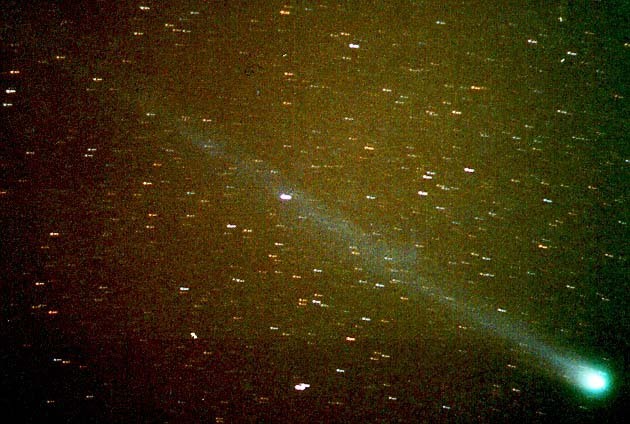 Also the remants of a jet or fragment can be seen 40% away from the comet in the tail. The second image is a computer processed version of the original photo.